On Sunday, April 17th at the close of a gorgeous, warm spring day, a man was fatally shot in Indian Mounds Park in St. Paul, Minnesota—brazenly, in daylight, on a day when hundreds of people had been picnicking in the scenic park overlooking the Mississippi River. This is an unfortunately familiar story, especially on St. Paul's troubled East Side where the shooting occurred. St. Paul's levels of crime and poverty are by no means exceptional, and many other large Midwestern cities have it far worse, but nonetheless, the East Side has been plagued by persistent and growing racially-concentrated poverty, and has seen its economic circumstances worsen from 1990 to 2010 even as other city neighborhoods' fortunes improved. The East Side neighborhoods were hit particularly hard by the Great Recession and foreclosure crisis. The neighborhood in question is indicated by the green star on the map to the right, produced by the Metropolitan Council, the Twin Cities' regional planning authority. It's smack in the middle of St. Paul's largest concentrations of both people of color and people in poverty. The headline about the murder hit me hard because about three hours before the shooting, I was in Indian Mounds Park. But the reason I was over there was to capture a very different, far more optimistic story about the nearby neighborhood of Dayton's Bluff, one which you don't see nearly as often in the media. It's a story of how a critical mass of Strong Citizens can be an incredible asset to a troubled area, and how local government can play a constructive role in the incremental revitalization of such an area, one house at a time. I mean literally one house at a time. I was there, along with dozens if not over a hundred other people, to tour six vacant homes which the city is selling for $1—you heard me right—with an eye to saving them from the wrecking ball and rehabbing them. This is part of a program begun in 2013 called Inspiring Communities, under the auspices of St. Paul's Housing and Redevelopment Authority. Through a variety of means including tax forfeiture and various federal neighborhood stabilization grants, the HRA acquired a lot of vacant properties in the wake of the foreclosure tsunami that swept across the country a few years ago. Seeking a way to salvage these homes, many of which are of some historic value, the city launched a scattered-site redevelopment program. St. Paul will put out a Request for Proposals (RFP) for renovation of a home that might otherwise be a candidate for demolition. If your proposal is accepted, you get to buy the house for $1, and you get a grant of up to $150,000 to put toward renovation. I spoke with Sarah Zorn from the HRA, who gave me some background. The Inspiring Communities program has led to renovation of about 160 blighted houses throughout the city, including some in Dayton's Bluff. But these six were, to put it charitably, the "hard cases," she explained. A previous proposal round had led to no viable proposals to save them. They were, no doubt, in rough shape. Going inside actually required signing a waiver releasing the city from any liability should I be injured. I saw broken pipes, sagging floorboards, obvious structural damage at every turn. These houses looked like quite reasonable candidates to tear down, if ever there was such a thing. And yet Dayton's Bluff neighbors—many of the same neighbors who successfully lobbied for a Historic District designation for the neighborhood in the 1990s—rallied to save the homes. They convinced the city to put out one more RFP, and to host a tour open to the public. They did the marketing themselves. This was a grassroots effort: it was made abundantly clear to me that this tour, in fact, would not have happened without the neighbors. With a push from the neighborhood, the vacant home tour was a smashing success. It was widely advertised on social media and turnout exceeded everyone's expectations. In a cute touch, a vintage 1954 bus took participants from house to house. At each house, at least one member of the neighborhood association was stationed, along with city staff, and the neighbors were more than a little knowledgeable about the history of not only the properties but the surrounding blocks, long-gone businesses and churches, all sorts of hyper-local history and lore. Whether this translates into successful renovation proposals is an open question. A member of the city's Historic Preservation Commission told me that the interest expressed had been a mix of prospective homeowners and developers / professional renovators. The developer proposals tended to be the more viable ones, while the motivated amateurs were "testing the waters." I don't know whether any of the houses will be saved. I expect not all six will be. They are in pretty awful shape. But the tour shined a positive spotlight on Dayton's Bluff, a victory no matter what happens. And even one house at a time can make a difference that has cascading effects on the stability and pride of a block, or an entire neighborhood. This was the message I got when I chatted with Barry Madore, who lives in a gorgeously refurbished home down the street from one of the vacant houses. He and his wife moved into Dayton's Bluff at a time when it was, he says, quite simply what they could afford. Now Madore feels he's incredibly fortunate to have had the opportunity to buy a renovated historic home in a neighborhood bursting with life and character and grassroots energy, and on this Sunday a couple weeks ago he was helping to pay it forward by working to make this last-ditch Inspiring Communities round a success. The loss of these homes could have a damaging effect on the economically precarious neighborhood, he explained. Each house has a unique history to it that is lost forever when it's torn down. And in a historic district, the whole is greater than the sum of the parts. The loss of six houses could mean the loss of the intact urban fabric of the blocks they sit on. Barry was eager to tell me about the passion and energy of the residents of Dayton's Bluff. Among other things, a food-centered renaissance appears to be underway. He pointed me to a new commercial kitchen down the street run by a sustainable-food nonprofit, Urban Oasis. They offer cooking classes and sponsor a community garden and a CSA program. The nearby neighborhood of Payne-Phalen has attracted regional attention in recent years for a booming restaurant scene, with many of the new spots owned by East Side locals. I asked Barry the question that was on my mind at this point: "Is gentrification a word on people's tongues around here?" Looking at brightly-colored houses that could be out of a storybook, and a new Mississippi Market location (a co-op known for serving more of a Whole Foods clientele than a food-stamps one), it was hard to think it wouldn't be. His response was that this is not a gentrification story—at least not so far. People talk about it once in a while, but the demographics haven't moved that way, and few, if any, residents feel threatened with displacement. Dayton's Bluff is a low-income, majority-minority neighborhood. Furthermore, fixing up houses that will continue to serve as affordable housing—five of the six in the vacant-homes auction have maximum income stipulations attached to the eventual buyer or tenant—may help to lock in affordability now while the neighborhood is cheap, and temper the effects of a change in demographics in the future. If your goal is neighborhood stabilization and averting gentrification, this is a more promising approach than larger-scale redevelopment. Advocates of incremental redevelopment are often met with skepticism from the mainstream of the planning and economic development professions because it can seem like they don't have any plans at all, just hopes. A less-muscular approach can read as fatalistic or at best not proactive enough, somehow inadequate to the scale of the problem. "One house at a time" doesn't feel like it's going to transform the neighborhood in the way that's needed to cure its social ills. That's why it's so important, if we're going to do right by places like Dayton's Bluff, to understand how the building of communal wealth and resilience actually happens in neighborhoods. Of course, we know how it happened the first time around. Strong Towns founder Chuck Marohn likes to introduce talks with a story of how his hometown of Brainerd, Minnesota was built in the late 19th century by "illiterate lumberjacks." In all seriousness, all across this country, beautiful historic urban places we now celebrate and cherish were built by people who were far poorer, and had far less access to credit, than the current residents of Dayton's Bluff. It can be done. That's not in question. But places that have fallen into decline we now tend to view as basket cases. We think some higher power needs to swoop in and save them. In a prior era this often meant urban renewal of the sort that Jane Jacobs famously, and presciently, decried. Even now that we don't flat-out bulldoze the homes of the poor a square mile at a time, we often bank on a single large project that's supposed to have a transformative effect. Maybe you get the one big employer you've been courting to establish an office—lure them in with tax incentives. Maybe you simply bulldoze the dilapidated houses without a plan to rebuild. I'm conflicted about it because I understand the damaging role of vacant buildings when they become home to squatters and criminals. But tear them down and then what? You can wait to assemble enough vacant land to build a multi-family low-income housing complex with a subsidy. This will house some people in need of housing. It probably won't make the neighborhood more lovable or resilient to crises. Or you can wait until the market shifts, until the area hits the gentrification tipping point—maybe you even try to push that process along. And when the tipping point arrives, what then? Our development financing system favors large projects and large increments of capital. For this reason, once the market in an area hits a point where it can support new construction, that area tends to quickly experience the kind of rapid, disruptive change we associate with gentrification: infill construction on every other corner (almost certainly less fine-grained than what it replaces), rising rents, and displacement of the poorest and most vulnerable original inhabitants. The North End [of Boston], as things stand, can get new construction only by submitting to a cataclysm of renewal and redevelopment—a cataclysm which would destroy its complexity, disperse its people and wipe out its businessmen. It would also cost an immense amount of money in comparison with the North End's needs for money to finance steady, continual improvement and replacement of what wears out. What redevelopment strategies dependent on waiting for the cataclysmic money to flood in all have in common is that they provide little to no role for the community already there. We implicitly treat them as a hopeless case too. What does it say to the community when your vision for revitalization is, "This place isn't worth saving as it is. We're just waiting to replace it with something new." Can you blame the neighbors for hearing, "We're just waiting to replace you with someone new"? Talk about demoralizing to would-be Strong Citizens who love their little corner of the world and might want to be part of its renaissance some day. True, communities in places like this are often under-equipped—because of poverty and social problems—to fix things without outside help. I'm not pushing a naive "bootstrapping" narrative here. They do need the government's help. The role of the City of St. Paul is vital. But the role the City has chosen to play here is a very prudent one. Part of the wisdom of it, counterintuitively, is the deliberately modest $150,000 cap on the renovation subsidy. In past RFP rounds, Barry told me, the city was getting developers asking for as much as $300,000, insisting that the houses couldn't be saved for any less. Dayton's Bluff residents who were experienced in fixing up old homes sought to prove them wrong. 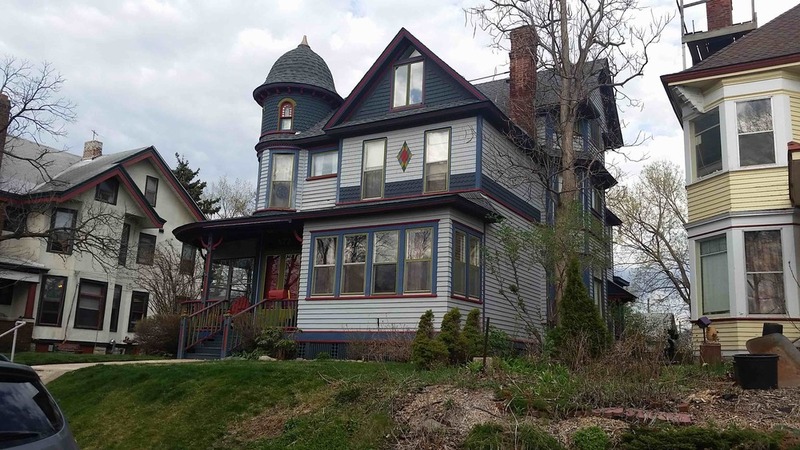 You can make an 1880s house livable for $150,000. You won't be putting in granite countertops for that. You won't be flipping it for a tidy profit. "The person who's going to do this is going to do it as a labor of love," said Barry. Back to Jane Jacobs and the North End of Boston for a minute. Today, the North End is one of America's classic historic neighborhoods, rich in character and beauty. In 1961, Jacobs wrote of it as an unlikely success story in the minds of both the planners of the day—who thought of it as a hopeless slum—and the financiers—who refused to underwrite mortgages or construction loans there as in nearly all older inner-city neighborhoods. Left to their own devices, the low-income residents rehabilitated "dozens and dozens of buildings," writes Jacobs, over the course of twenty years by bartering fix-it skills and making incremental improvements as they could afford to. In a strange way, the absence of outside capital almost became a blessing. Sounds familiar? The North End was an exception to that era's rule of inner-city decline and decay, but it's a fantastically successful exception and we can still learn from it today. Incremental investments in revitalization have an economic payoff that's subtler and harder to quantify than that of a classic urban renewal project with a big increment of capital. Making the case for that payoff is important. To a cynic, this looks like a waste of money. These houses are the worst of the worst. Just let them be demolished. You'd get a better return on investment building something new in their place. One might argue that a historic preservation district itself is a luxury a place as down on its luck as Dayton's Bluff can hardly afford. On the contrary. This is a super smart investment. Dayton's Bluff's new golden age, when it happens (and it will), is going to come about because the place is lovable, and well loved. How does being lovable put money in anyone's pockets? The answer is the multiplier effect of private investment. The city, by committing resources to save one house at a time, has put out a call for Strong Citizens—not deep-pocketed developers—to step up to the plate. It's leveraging the resources of passionate individuals—their time, their skills, their social capital—as a sort of bonus multiplier on the limited amount of money and staff time the city itself can put forth. And there's a virtuous cycle that this can unleash when it works. Each house rehabbed on a block makes it more attractive to do the next one. One house at a time. One block at a time. One neighborhood at a time. The historic district is central to this approach. A neighborhood can resist economic shocks more easily if it's viewed as having some intrinsic value—something that makes it unique. Property values won't fall as far in a recession, and that will keep more low-income homeowners in their homes. An approach like this may also help combat neighborhood stigma. What if you can get the average St. Paul resident to picture beautiful historic homes when they hear "Dayton's Bluff"? Of course, there are other things the average St. Paul resident still pictures when they hear "Dayton's Bluff," and crime-scene tape is sadly high on the list. The shooting on the day of the tour reminded me that this kind of effort can be one step forward, two steps back. There are social ills tied to economic forces that are far beyond the power of the Housing and Redevelopment Authority to deal with. The Inspiring Communities program isn't a panacea. But it is a Strong Towns approach in action. It's a campaign of small investments, a large number of them, with the potential for a far more durable return on investment in the long run. It will take patience and perserverance. It will take a lot of heart. A neighborhood poised for sustainable prosperity is one that has built a community of people deeply committed to their little corner of the universe. We've shared this quote, adapted from G.K. Chesterton, before on Strong Towns, but it remains apropos: "Men do not love Rome because she is beautiful. Rome is beautiful because men have loved her."